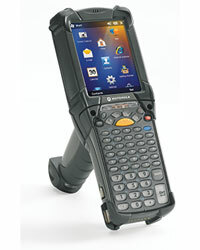 The MC9200 provides a cost effective alternative that offers 802.11n wireless speeds and the rugged design that has made this product line the world’s topselling rugged handheld mobile computer. MC9200 Premium: This top-of-the-line model offers advanced features, including extra memory for the most graphics intensive applications; an integrated RFID tag for customers who have or are planning to deploy RFID; plus Integrated Sensor Technology (IST) to protect battery cycle times — especially important for demanding applications. MC92N0-G90SYEYC6WR Gun, 802.11a/b/g/n, LRI SE4600, VGA Color, 1GB RAM/2GB Flash, 53 Key, CE 7.0, BT, IST, Condensation Resistant. SE4600 sku's cannot be upgraded to Andriod . BTRY-MC9X-26MA-01 Spares & Accessories Other Accessories MC90XX-G/K, MC9190-G, MC9200 Powerprecisionspare Lithium Ion Battery, 2600 Mah. CRD9101-4001CR Spares & Accessories Other Accessories MC90/MC91/MC92 4 Slot Charge Only Cradle. Order SAC9000-4000R for spare battery charging. Must order Power Supply PWR-BGA12V108W0WW, DC Line Cord CBL-DC-382A1-01 and country specific 3-wire grounded AC Line Cord. CRD9101-410EES Handheld Accessories Cradles/Docks/Bases MC90/MC91/MC92 4 Slot Ethernet Charge Cradle Kit US. Includes: 4 Slot Ethernet Cradle CRD9101-4001ER, corresponding Power Supply, DC Line Cord and US 3-wire grounded AC Line Cord. CRD9101-411EES Handheld Accessories Cradles/Docks/Bases MC90/MC91/MC92 4 Slot Ethernet Charge Cradle Kit INTL. Includes: 4 Slot Ethernet Cradle CRD9101-4001ER, corresponding Power Supply and DC Line Cord. Must purchase country specific 3-wire grounded AC Line Cord separately. Z1AE-MC92XX-3100 3 YEAR(S) ZEBRA ONECARE ESSENTIAL, 3 DAY TAT, FOR MC92XX, PURCHASED WITHIN 30 DAYS, WITH COMPREHENSIVE COVERAGE AND STANDARD MAINTENANCE FOR STANDARD BATTERY. Z1AE-MC92XX-3500 3 YEAR(S) ZEBRA ONECARE ESSENTIAL, 3 DAY TAT, FOR MC92XX, PURCHASED WITHIN 30 DAYS, WITH COMPREHENSIVE COVERAGE AND REFRESH FOR STANDARD BATTERY. MINIMUM ORDERABLE QUANTITY IS 10. Z1AE-MC92XX-3503 3 YEAR(S) ZEBRA ONECARE ESSENTIAL, 3 DAY TAT, FOR MC92XX, PURCHASED WITHIN 30 DAYS, WITH COMPREHENSIVE COVERAGE AND REFRESH FOR STANDARD BATTERY. INCLUDES COMMISSIONING. MINIMUM ORDERABLE QUANTITY IS 10. Z1AE-MC92XX-5500 5 YEAR(S) ZEBRA ONECARE ESSENTIAL, 3 DAY TAT, FOR MC92XX, PURCHASED WITHIN 30 DAYS, WITH COMPREHENSIVE COVERAGE AND REFRESH FOR STANDARD BATTERY. MINIMUM ORDERABLE QUANTITY IS 10. Z1AE-MC92XX-5C00 5 Year Zebra OneCare Essential. Includes Comprehensive Coverage. Does not include coverage for cradles. Z1AE-MC92XX-7C00 7 YEAR(S) ZEBRA ONECARE ESSENTIAL, 3 DAY TAT, FOR MC92XX, PURCHASED WITHIN 30 DAYS, WITH COMPREHENSIVE COVERAGE. Z1AS-MC92XX-3503 3 YEAR(S) ZEBRA ONECARE SELECT, ADVANCED REPLACEMENT, FOR MC92XX, PURCHASED WITHIN 30 DAYS, WITH COMPREHENSIVE COVERAGE AND REFRESH FOR STANDARD BATTERY. INCLUDES COMMISSIONING. MINIMUM ORDERABLE QUANTITY IS 10. Z1AS-MC92XX-3C03 3 Year Zebra OneCare Select. Includes Comprehensive Coverage. Does not include coverage for cradles. Requires customer-supplied spares pool in NA, not available for LA. Z1AS-MC92XX-5503 5 YEAR(S) ZEBRA ONECARE SELECT, ADVANCED REPLACEMENT, FOR MC92XX, PURCHASED WITHIN 30 DAYS, WITH COMPREHENSIVE COVERAGE AND REFRESH FOR STANDARD BATTERY. INCLUDES COMMISSIONING. MINIMUM ORDERABLE QUANTITY IS 10. Z1AS-MC92XX-5C03 5 Year Zebra OneCare Select. Includes Comprehensive Coverage. Does not include coverage for cradles. Requires customer-supplied spares pool in NA, not available for LA. Z1AY-MC92XX-3000 3 Year(s) Zebra OneCare service with 10 day TAT,for MC92XX, Purchased within 30 days, with Non Comprehensive coverage. Z1BE-MC92XX-1000 1 Year Zebra OneCare Service Center Essential. Does not include Comprehensive Coverage. Does not include coverage for cradles. Z1BE-MC92XX-3000 3 Year Zebra OneCare Service Center Essential. Does not include Comprehensive Coverage. Does not include coverage for cradles. Z1BS-MC92XX-1003 1 Year Zebra OneCare Service Center Select. Does not include Comprehensive Coverage. Does not include coverage for cradles. Requires customer-supplied spares pool in NA, not available for LA. Z1BS-MC92XX-3003 3 Year Zebra OneCare Service Center Select. Does not include Comprehensive Coverage. Does not include coverage for cradles. Requires customer-supplied spares pool in NA, not available for LA. Z1R1-MC92XX-2C00 2 Year(s) Zebra OneCare Next Business Day Onsite (US and UK only)for MC92XX, Renewal, with Comprehensive coverage. Requires Customer owned spares pool in NA. Not available in LATAM. Z1RC-MC92XX-1C00 Z1RCMC92XX1C00 1 YEAR(S) ZEBRA ONECARE CENTRAL ONSITE (US AND UK ONLY)FOR MC92XX, RENEWAL, WITH COMPREHENSIVE COVERAGE. Z1RC-MC92XX-2C00 2 Year(s) Zebra OneCare Central OnSite (US and UK only)for MC92XX, Renewal, with Non Comprehensive coverage. Z1RE-MC92XX-1C00 1 Year Zebra OneCare Essential Renewal. Includes Comprehensive Coverage. Does not include coverage for cradles. Z1RE-MC92XX-1C03 1 Year(s) Zebra OneCare Essential, 3 day TAT, ﾠfor MC92XX, Renewal, ﾠwith Comprehensive coverage. Includes Commissioning. Z1RE-MC92XX-2500 2 YEAR(S) ZEBRA ONECARE ESSENTIAL, 3 DAY TAT, FOR MC92XX, RENEWAL, WITH COMPREHENSIVE COVERAGE AND REFRESH FOR STANDARD BATTERY. MINIMUM ORDERABLE QUANTITY IS 10. Z1RE-MC92XX-2503 2 YEAR(S) ZEBRA ONECARE ESSENTIAL, 3 DAY TAT, FOR MC92XX, RENEWAL, WITH COMPREHENSIVE COVERAGE AND REFRESH FOR STANDARD BATTERY. INCLUDES COMMISSIONING. MINIMUM ORDERABLE QUANTITY IS 10. Z1RE-MC92XX-2C00 2 Year Zebra OneCare Essential Renewal. Includes Comprehensive Coverage. Does not include coverage for cradles. Can only be ordered ONCE after initial Zebra OneCare contract expires. Z1RM-MC92XX-3C03 3 Year(s) Zebra OneCare Essential, 2 day TAT, ﾠfor MC92XX, Renewal, ﾠwith Comprehensive coverage. Includes Commissioning. Z1WS-MC92XX-1003 1 Year Zebra OneCare Service Center Select Renewal. Does not include Comprehensive Coverage. Does not include coverage for cradles. Requires customer-supplied spares pool in NA, not available for LA. Z1WS-MC92XX-3003 3 Year Zebra OneCare Service Center Select Renewal. Does not include Comprehensive Coverage. Does not include coverage for cradles. Requires customer-supplied spares pool in NA, not available for LA.